Now, you will need to connect your printer to the internet. If you plan on using your Voxel8 printer wirelessly, then skip to the next section on configuring your printer wirelessly, otherwise continue with the ethernet instructions, below. Prior to performing either of the networking options below, ensure that ports 443 and 22 are open for outbound traffic, and port 80 is able to accept inbound connections if you wish the use the control interface. Your printer must communicate to our cloud service using these ports. If networking will be an issue for you, consider purchasing our Enterprise package for a behind the fence solution. NOTE: You can setup both WiFi and physical ethernet if you'd prefer to have both options and be able to toggle back & forth. Just follow -both- sets of instructions below. 1. Locate the supplied Voxel8 Ethernet cable (see Picture 001) that will reach to your Developer’s Kit Printer to a Ethernet network socket close by. NOTE: We presume you are setting up a physical Ethernet connection that supports DHCP here. This is the preferred connection mechanism we recommend to use for optimal printing experience. If your configuration varies, then please see the Networking Configuration help page for other possible configurations. 2. Find the Ethernet jack on the lower back middle of the Voxel8 printer (see Picture 002) and then plug in the supplied Voxel8 Ethernet cable (see Picture 003). Picture 002: Ethernet RJ45 jack. Picture 003: Ethernet is plugged in. 3. Plug the opposite end of the network cable into an available Ethernet port (see Picture 004) that is close by to your Voxel8 printer (e.g. router, Ethernet wall jack). TIP: Make sure that you do not leave the Ethernet cable exposed as a trip hazard around your printer during operation. Picture 004: Voxel8 Printer plugged into an Ethernet RJ45 wall jack. 4. Following networking by ethernet, you will be presented with a unique activation token that is different than the one below (see Picture 005). When this appears, write it down or take a picture of it. You will use this unique activation token during the upcoming registration process. Picture 005: Activation Token assigned to a printer (NOTE: your unique token will be different than the one pictured). NOTE: You can find this activation token, later, saved under the Settings->Printer Info section of the touch screen interface. 5. You can verify the IP Address is being served to the Developer's Kit Printer by visiting "Settings->Printer Info" in the touch screen user interface. Picture 006: Physical ethernet IP Address can be looked up in Settings->WiFi. 6. 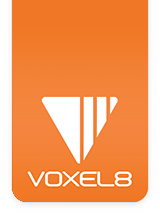 Check to ensure that your Voxel8 Developer’s Kit printer is connected to the internet by looking for the network connectivity icon on the touch panel display (see Picture 007 and 007-A). Picture 007: Printer is connected to the internet via physical ethernet connection. Picture 008: Load the Voxel8 dashboard in a web browser. Now that you have configured to connect to a network it's time to move to registering a dashboard account and activating your printer. If you wish to setup a wireless connection to the Developer's Kit Printer then follow the instructions below. 1. Select "Settings->WIFI" (see Picture 009) from the touch screen. 2. First hit the "Refresh" button (see Picture 010A) to make sure that all your networks within range are detected. Next, select a wireless network SSID in the list (see Picture 010B) by pressing to connect to it. Picture 010A: Before any wireless networks are detected. Picture 010B: After refreshing to detection WIFI networks in the vicinity. 3. After selecting a WiFi network, enter in the password (see Picture 011A) by using the onscreen virtual keyboard that appears in bottom of the screen (see Picture 011C) after pressing the "Connect" button (Picture 011B). Picture 011: Entering in a password for the network. TIP: If you have a hard time entering in the WiFi password you can plug in a USB keyboard into the back of the Printer to type it in. Do not leave the keyboard plugged into the USB, however. 4. Check to ensure that your Voxel8 Developer’s Kit printer is connected to the internet by looking for the network connectivity icon on the touch panel display (see Picture 012 and 012-A). Picture 012: Printer is connected to the internet via WiFi connection. 5. Following networking via WiFi connection, you will be presented with a unique activation token that is different than the one below (see Picture 005). When this appears, write it down or take a picture of it. You will use this unique activation token during the upcoming registration process.